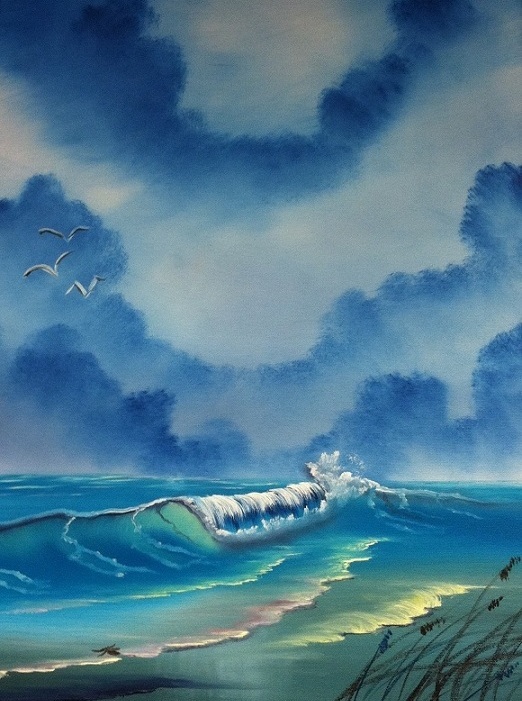 This is an example of a seascape taught by Anu. Learn through hands-on instruction, the unique Wet-on-Wet™ style of painting made famous by Bob Ross® in his Joy of Painting series of books, videos and seen on more than 300 PBS stations throughout the country. Class offerings include a variety of landscapes and seascapes, and are taught by certified Ross instructor, Anu Brookins. Lessons vary from 3-4 hours. During this time you will start from a blank canvas and end with a completed painting that you can take home to amaze your family and friends! All materials and supplies for the class are provided by the instructor. You just need to show up, maybe bring an apron or smock, and follow the step-by-step instruction, and prepare to create amazing landscapes or seascapes!